100mph Speedometer. Dual Exhaust. New Shocks. 15 Inch Chrome Steel Wheels. Dual Mufflers. Oil Pressure Gauge. 28 Spline Rear Axles. Dual Tail Pipes. Original 289cid Small Block Ford Engine. 289 Fender Emblems. Engine Dated December 1967. Original 2BBL Carburetor. 4.11 Gear in Rear Differential. Factory AM Radio. Original 3-Speed Manual Transmission. 4-Wheel Drum Brakes. Factory Dash. Original Ford 9 Inch Rear End. 7-Blade Flex Fan. Factory Instrumentation. Padded Dash. 7mm Plug Wires. Factory Steering Wheel. Painted Valve Covers. 8.75 Inch Ring Gear in Rear Differential. Front Bucket Seats. Removable Rear Seat. All Steel Body. Front Seat Belts. Stock Cast Exhaust Manifolds. Alternator Gauge. Fuel Gauge. Stock Cast Intake. Bed Liner Coated Inside on Floor. General Grabber AT2 Tires. Stock Fuel Tank. Bronco Front Fender Emblems. Grabber Blue Exterior. Stock Style Distributor and Coil. Chrome Front and Rear Bumpers. Heater Lines are Hooked Up. Stock Style Radiator. Cream Colored Hardtop. Limited Slip Rear Differential. Temperature Gauge. Cream Painted Grille. Locking Front Hubs. Tires Front: 31 x 10.50R15LT. Cream Upholstery. Mechanical Fuel Pump. Tires Rear: 31 x 10.50R15LT. Dana 30 Front Differential. Multi Leaf Rear Suspension. Vehicle Build Date of January 1968. 4 Inch Suspension Lift. 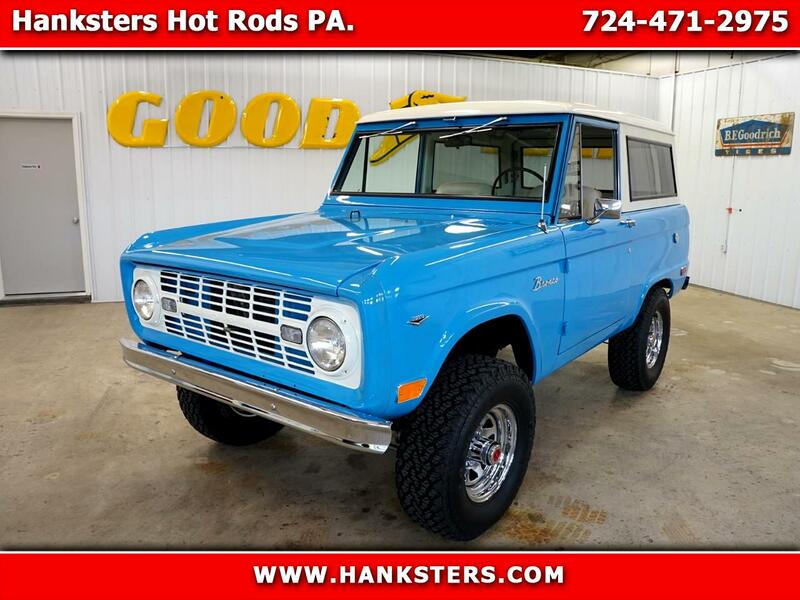 Message: Thought you might be interested in this 1968 Ford Bronco 4WD.